The Exploratorium is a hands-on place to explore and have fun with science. Featuring a unique approach, the Exploratorium spurns technology, fancy displays and gadgets, instead relying on simply made, hands-on exhibits, accompanied by explanations that are approachable and avoiding scientific jargon. It's the simplicity that makes it so appealing and so much fun for all its visitors - and making it #1 among California's science museums, in our opinion. If you visited the Exploratorium or talked to someone else who went there before 2013, or if you have read an out-of-date online profile of it, you may think it's located near the Marina, a smaller space that was filled to capacity with curious visitors. Don't listen to them. The Exploratorium's waterfront home is gorgeous, spacious, well-lit and chock full of fun and interesting things to do and see. Most of the classics from their former home were re-installed here, and they added new and more interesting ones, taking advantage of all their new space. You'd have to work at it to go more than half a dozen steps on the way to your next discovery, but the layout is so smart that it never feels crowded. And the displays' simple designs ensure that things seldom break down, a problem common in other science-oriented museums. Visitors never seem to tire of puttering around the Exploratorium, and it's enjoyable on levels that appeal to everyone, from the small child who might just enjoy watching things move (or moving things themselves) to the veteran scientist who still enjoys the fundamentals. During our last visit, every single visitor seemed to be engaged in something. If you're in town on one of the days when they're open late, you can enjoy the Exploratorium after other attractions are closed and some evenings are for adults only. Check their current hours. The Exploratorium is one of San Francisco's top-rated sights. It's also one of the most fun places go with the kids in San Francisco. Bypass the line on the way in and order your Exploratorium tickets online direct before you go. The Exploratorium is one of the attractions included with the money-saving, multi-attraction San Francisco CityPASS. If you want to go out and come back, exit through the West Gallery, and get your hand stamped for re-entry. If you get hungry at the Exploratorium, you'll have quite a few choices. Outside around the edge of the pier, three-wheeled, solar-powered food carts serve coffee and soft-serve ice cream. The Seismic Joint Café offers takeaway food items during daytime hours. At the back of the museum, with big windows looking out on the Bay is Seaglass Restaurant, serving a diverse menu that may include tacos, quesadillas, pizzas, salads and sandwiches. Prices are comparable to moderately-priced lunch spots in the area, but the menu may not include enough choices for picky eaters. Courtesy of Amy Snyder ©Exploratorium, All rights reserved. 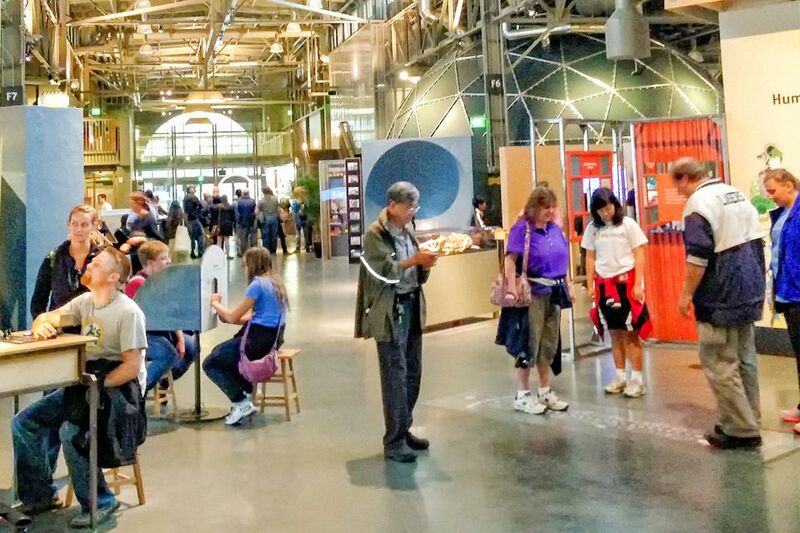 Kids of all ages like the Exploratorium, but it's better for those older than five. They'll learn more with help, but they seem to have a good time just playing around even without it. If your kids are like most, they won't be able to resist the toilet drinking fountain, located across from the lockers near the entrance. In fact, for some potty-obsessed youngsters, that could be the highlight of their visit. It's not just a gimmick, but also a learning experience that invites you to test your assumptions and associations. The After Dark series is an Adult Only evening at the Exploratorium. Not only is quieter then, but they also put an "adult" spin on some of the popular attractions. Allow about half a day, and if you have less than 2 hours to spend, it will be hard to get full value from your admission. You'll find fewer visitors at the Exploratorium during the week and especially during their evening hours. The Exploratorium is located in a fun tourist area along the waterfront. Find out more about the area here. If you're going to the Exploratorium and getting to the city by CalTrain, it's 2 miles from the train station, where you can transfer to the Muni Metro N or T Line, get off at Embarcadero Station and walk 15 minutes along the waterfront. The nearest BART stop is Embarcadero Station, which is also about a 10- to 15-minute walk. You can get parking discounts on weekends or weekdays after 4:00 or 5:00 p.m. The Exploratorium website lists parking lots that offer a discount with validation. Just across The Embarcadero, a privately owned parking lot charges a reasonable price for 4 hours, but costs escalate quickly if you stay longer.